Goa is one of the more prosperous states of this country in terms of personal wealth and is much more liberal in its ideas, yet there seems to be something that ails us as a society. An insidious evil has taken us from being known as the capital of fun and frolic to having a suicide rate that is far above the national average ie 18.4 per lakh population to the national average of 11.7. Dr Peter Castelino, Donna Noronha and their team at COOJ (Cause of Our Joy) Mental Health Foundation have been working tirelessly to create awareness of the problem and offer avenues to seek aid and respite from whatever is troubling the afflicted individuals. 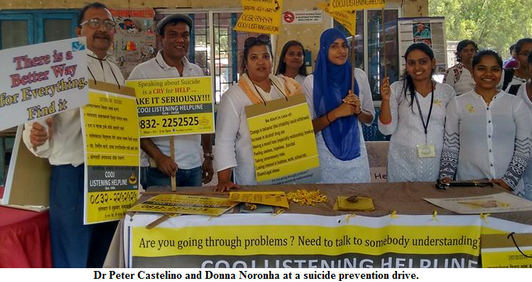 Donna doubles as public relations officer for COOJ and volunteer for the suicide helpline that the NGO has set up. 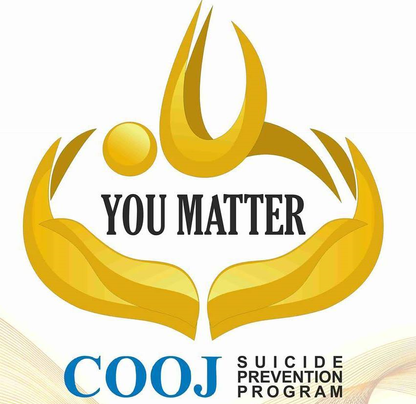 The suicide prevention programme is called You Matter. ‘The helpline started on the 4th of September, 2013. We started suicide prevention in 2012 basically to create awareness and what was the need of the hour was a helpline,’ says Donna. Research was conducted to find able and dependable collaborators. They finally decided on an international organisation called Befrienders Worldwide, which has a strong presence in India and facilitates the functioning of suicide helplines all over the world. Befrienders Worldwide has a head office in Hyderabad known as Befrienders India. They are soon going to be associated partners with the COOJ suicide helpline and have fourteen suicide helplines in India. The suicide rate in Goa is alarming, to the extent that when COOJ organised a suicide prevention drive in Ponda on the 25th of February there was a suicide case a day before the programme and another on the day of the programme too. A part of the problem seems to be the reluctance to acknowledge mental illness, which is on the higher side in Goa, and its implications, because many reported cases of suicide point to some element of mental illness. The government is not doing enough to address the problem. Counsellors in colleges may be in their place but there needs to be awareness and connectivity in this regard at Gram Panchayat level and at various other levels. From June to December of 2014 there have been over 85 reported suicides and most of them are from the Ponda- Bicholim area. Of course, this could be due to the fact that there are more reported cases here. There has been a decline in the rate of suicides in recent times which is promising but the mental health connection has to be made. The stigma of mental illness is the biggest deterrent in bringing about a larger change in the prevailing situation. A five day training programme for volunteers is conducted by COOJ. Two of these were held last year. They have a good number of people attending them but that always fall back when it comes to volunteer assessment. This tests the level of commitment and compassion. Some do manage to make it through. ‘We have some retired teachers…even some young people coming,’ says Donna. The scarcity of funding is deplorable as the government looks the other way. A few well-wishers who know and believe in the NGO’s work help out from time to time. People call back after the initial crisis has settled. The programme respects the caller’s right to privacy and no one is required to disclose personal information unless they want to and only in the strictest confidence. If the caller threatens suicide, he or she is asked if they would like to have an ambulance sent and if the caller declines the volunteers respect the decision. Apart from awareness drives for suicide prevention, Suicide Prevention Day has been observed from 2012. There have been many stress buster programmes in schools and colleges, and gatekeeper workshops, where parents and children are taught to listen to and help their wards and friends, respectively, if they are verging on life threatening behaviour. Plans are being made for such programmes for the police and the media. The media would be enlightened so as to avoid giving vivid details of the manner of suicide as it can give rise to copycat suicide attempts. One good example is the highly publicised suicide of actor Robin Williams provoking people to take the same path. The volunteers share the pain of the callers, hence, they necessarily have to be mentally strong and possess an inner strength that will let them bounce back. If they encounter a particularly difficult case, they have a mentor within the helpline group who they can speak to and from whom they can seek relief. ‘One of the greatest things about the principles and guidelines is that they are non-advisory,’ says Donna, as peace of mind exists for the simple reason that you have just listened. In critical circumstances like this the worst thing you can do is start advising the person. The most important thing they need to feel is that someone cares because someone is willing to take the time to listen to what they have to say.